This was the advice my late father gave me as I was attempting to decide what to do at university. I couldn’t decide whether to do history or art. 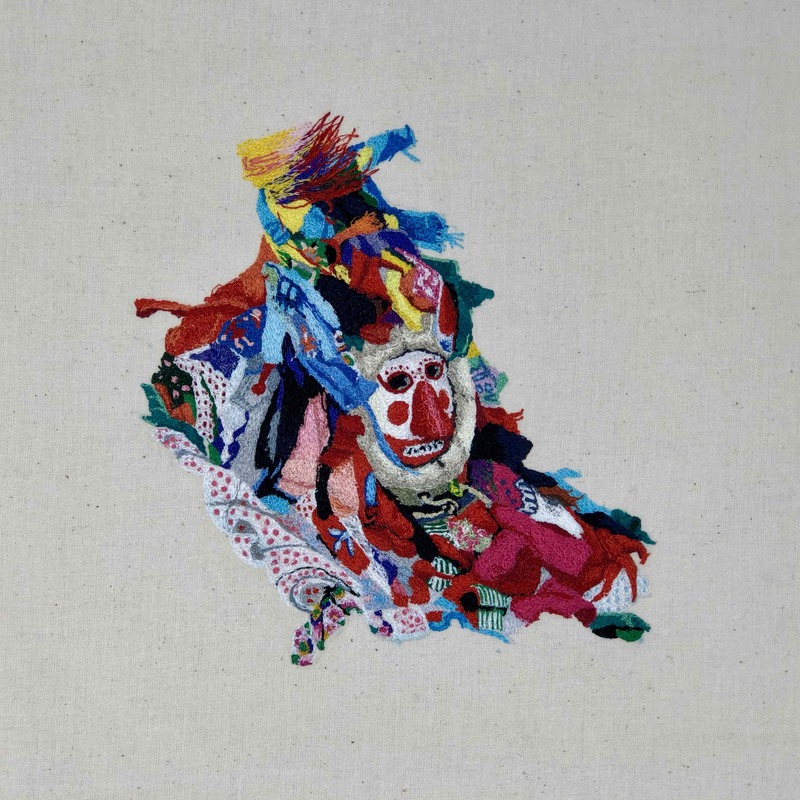 My name is Lewis MacDonald, I am 24 and currently an aspiring textile artist. My focus right now is Free Motion Embroidery, also known as Thread Painting. This is a technique where you take a standard sewing machine and ‘drop the feed dogs’ (this is the term for lowering the little teeth on the base of a sewing machine which feeds the fabric in one direction whilst sewing). 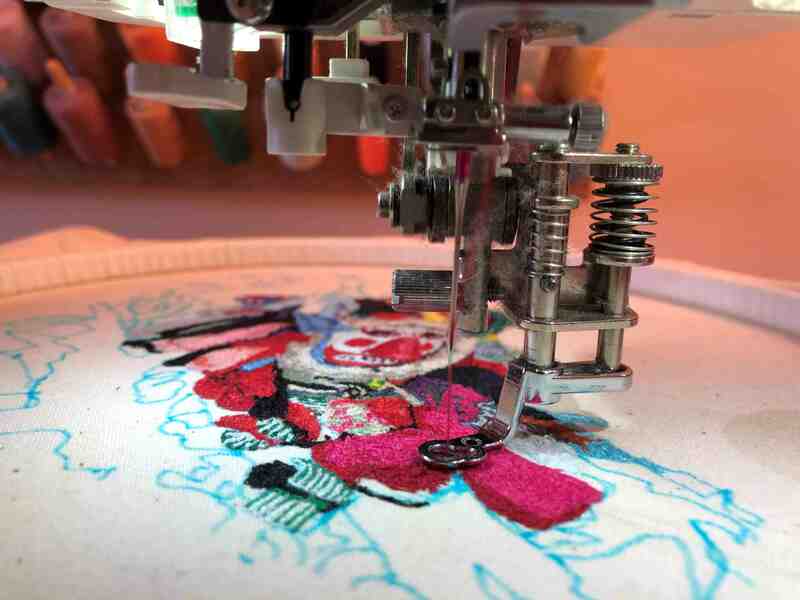 If you drop the feed dogs and swap a standard sewing machine foot for a ‘free motion quilting foot’, you have full control over the fabric and can create any design you wish. The best way I find to explain what it is like, is by saying that it is like painting, but instead of moving the brush you move the paper. Each embroidery takes me many hours of focused creativity and precision. It’s been a long journey since I first found out that I had a talent for Free Machine Embroidery, unusual as well in that I am male. Many events have also taken place, both good and bad, which have forced me to push back getting into my art. When I was in Sixth Form, at the West Somerset Community College, I wanted to copy a design that I saw on a collection of Alexander McQueen’s autumn fashion which was military inspired. The lapel on one of the coats had an oak leaf pattern in gold that fitted well with my theme for that term. Unfortunately, the CAD/CAM machine that normally makes these patterns was being used by another student. Impatient, I decided to attempt to make the design myself on a standard sewing machine by setting it up in the way that I have described above. It worked amazingly well, and so I went home that day and attempted something more detailed like a family photo. From that point on I continued to test and improve my skills. In 2014 my work was part of a WW1 Centenary Exhibition held in St Andrews Church Minehead, which raised money for the Royal British Legion. And in 2015 I was one of the winners of the Marshwood Vale Art Competition and had my work displayed in the Bridport Art Centre. I decided to study history at university, on my father’s advice, and not to ruin my love for art. So, I had to focus more on education than embroideries. Still, all was going well for my art and my life until September of 2015 when I crashed my motorbike travelling home from Exeter University. After this I suffered from a bout of depression and anxiety, complicated by my ADHD (Attention Deficit Disorder). This drastically worsened in October 2016 when I learnt of my father’s diagnosis of cancer and then had to cope with his death only a few months later. 2017 was a difficult year. But with counselling and determination I am finding myself at a new beginning (I hope). I am working on my art, myself and my health, all in the hopes of becoming a better person. So now you are up to date, what am I doing, and what are my plans? Currently, I am trying my best to ‘get my name out there’. I’m looking for commissions as well as working on pieces that can be sold. I have discovered that I can replicate most things with very intricate, detailed accuracy. I particularly enjoy sewing images of pets. I’m not too bad at humans either. Also, on the subject of animals but perhaps more topically, I’ve always had a love of the Hobby Horse. For me, it heralds a time of happiness and celebration in Minehead, especially with its crazy dancing and music, that I only wish it could be a bigger event. One day, I would like to see the Minehead Hobby Horse not just as a small march around the town, but expanded into a whole festival for a day, with markets, music and fireworks. 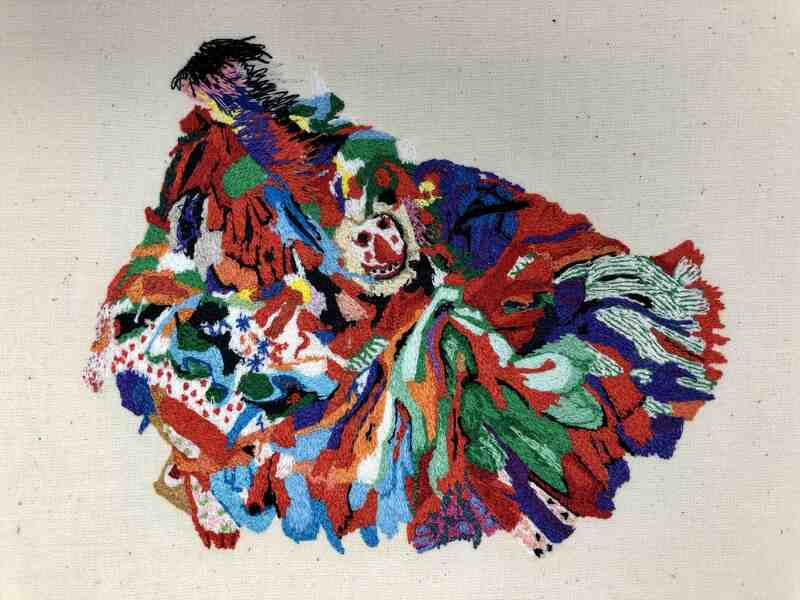 It could be a big tourism event that would draw people from all around, as does the Padstow ‘Obby oss.’ But anyway, I also enjoy sewing the Hobby Horse as a challenge, it is such an intricate thing to be able to get right, particularly with the massive variety of colours and its movement of the dance. An innovative project taking place in Watchet, to get local teenagers to design and build their own common room, has just begun, with a hugely successful architect-led design workshop. In late November 25 local teenagers come together to design a structure for Splash Point Pleasure Ground in Watchet, under the guidance of award-winning architect, Kate Darby, national timber expert, Charley Brentnall, local volunteer group, the Watchet Community Makers, with Georgie Grant and Sally Lowndes from the Onion Collective as facilitators. The workshop, funded by the Youth Social Action Fund and the Courage Family Fund, took place in Watchet’s Phoenix Centre, and included free pizza. After working together to establish what was wanted and needed for local teenagers, and how these ideas might translate to the site, the teenagers were split into four groups, and asked to draw, then 3D model their ideas using balsa wood. They all then voted on their favourite structures, and the key aspects of each that should be incorporated into the final design. The workshop was deemed a huge success by all involved, and Kate was particularly taken aback by the level of comfort the local teenagers felt in creating and discussing their ideas. Architect Kate Darby said: “It was fascinating to see so many engaged and creative young people come together to design with such confidence. All of the models incorporated really interesting architectural features, and the teenagers also did a wonderful job of presenting their work to the room. My job now is to amalgamate the key features into one coherent structure that fits their brief. A first draft will be presented to them for comments before I make amends and the Onion Collective can submit to planning. Splash Point Pleasure Ground is a community area on the clifftop in Watchet that looks out onto the marina. It’s managed by community-led regeneration company, Onion Collective CIC, on behalf of the town. The grounds are accessible via the England Coast Path that begins at the Goviers Lane Railway crossing in Watchet. Onion Collective facilitated a similar project in 2015, when a group of 50 local volunteers built a pavilion at Splash Point over the course of a single weekend. It is now enjoyed by many as a place for picnics, barbecues and events. This time the Onion Collective is working with teenagers to make the site a place that they also feel able to appreciate and enjoy. Onion Collective Project Officer, Sally Lowndes says: “This project came about because local teenagers came to us to ask for help identifying a space they could use for socialising. If you know a Watchet-based teenager who wants to be involved in this project, feeding back on the design, or helping with the build, they can get in touch by contacting Onion Collective on info@onioncollective.co.uk / 01984 633496. The project was funded by Somerset Community Foundation’s Youth Social Action Fund. 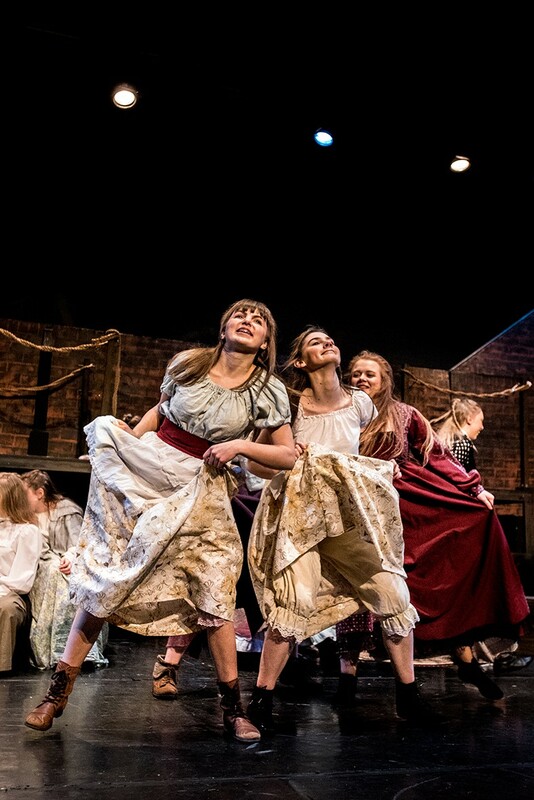 Last night, Monday 20 February, we got a sneak preview of the forthcoming show, Oliver! the musical, which opens tomorrow night (22 Feb) at The Regal Theatre, Minehead. Following the success of ‘The Magic of The Musicals’, Fusion Young Performers will be appearing in this new production between 22 and 25 February with Lionel Bart’s much-loved classic musical, which is packed full of well-known songs such as ‘I’d Do Anything’, ‘Where is Love?’, ‘Consider Yourself’, ‘Reviewing the Situation’, ‘Oom Pah Pah’ and lots more… all accompanied by a live 12 piece orchestra. 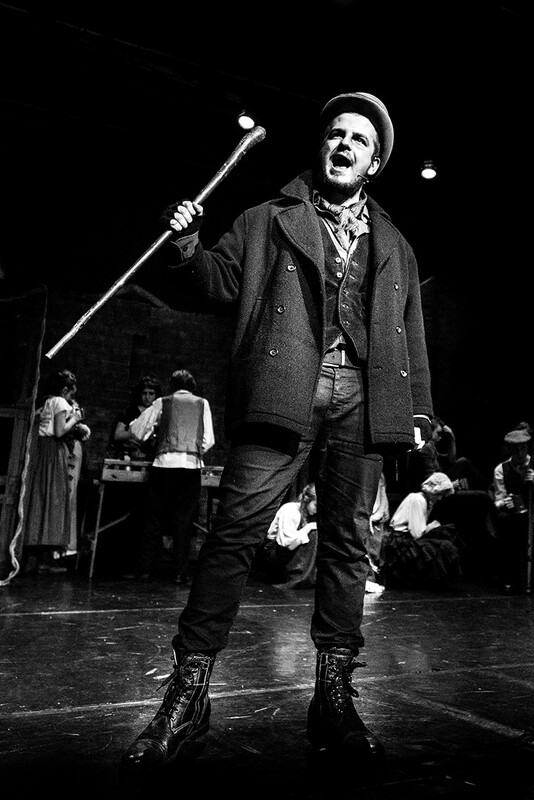 Lionel Bart’s Oliver! 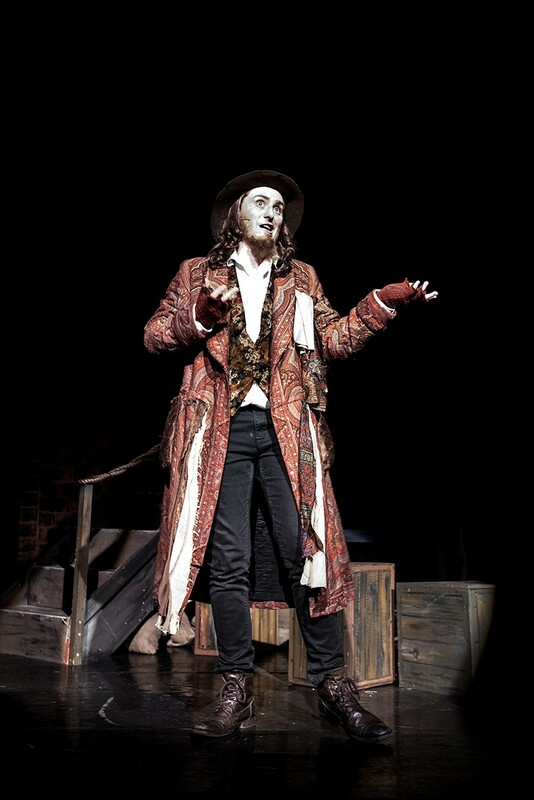 brings Charles Dickens’ classic tale to life, following young, orphaned Oliver Twist (brilliantly played by local youngster Joel Savage) as he navigates London’s underworld of theft and violence searching for a home, a family, and – most of all – for love. With an energetic cast of over 50 young people aged 24 and under – many of whom starred in the 2014 MATA summer production of Les Misérables and with direction by Sarah-Jane Cross, choreography by Lorraine Ahern and musical direction by David Pitts, this promises to be a show full of dazzling dance routines, amazing singing and fantastic performances from some of the best young talent in the area. Music, lyrics and book by Lionel Bart. By arrangement with Musicscope and Stage Musicals Limited of New York. This is an amateur production. Tickets were sold out two weeks ago and so the next time you hear about a forthcoming performance by Fusion Young Performers you’ll need to snap your ticket up fast! Top photo: by Andrew Hobbs Photography. On Sunday 5 February, the West Group Young Farmers will be at the Regal Theatre in Minehead with their Annual Performing Arts Competition. This year’s theme is Entertainment and the afternoon promises to be full of interest, enjoyment and laughter as the four Young Farmers’ Clubs in our local area compete against each other for their annual theatre performances. The members are aged between 10-26 years old and each team will present a short ‘Entertainments’ performance to display their drama, dance, singing and comedy skills. At the end of the day, the judges will appoint their chosen winner. The doors open at 1pm and the first performance begins at 2pm. Tickets cost £7.50 (includes a programme) and are now available from the Regal Box Office (01643 706430), which is open 10am until 3pm Monday to Friday, and 10am to 1pm on Saturdays. Under 13s get in free! The Devon Federation of Young Farmers Clubs recently held their travel interviews which saw over 40 members from across the county apply for the 2017 scholarships. The members completed application forms and attended interviews at the Devon Young Farmers centre in Exeter. Extended thanks to the interviewers; Marion Cann, Neil Grills, Clare Edworthy, Chris Berry, Faye Heal and Mark Davis who have all previously been members of Devon YFC and travelled on the scholarship programme. Difficult decisions were made to who the places were awarded to, as the standard of members was fantastic, making decisions extremely tough. The juniors who have gained a space on the exchange with Finland – Ben Kittow (Culm Valley YFC), Charlotte Lake (Witheridge YFC), Ben May (Newton St Cyres YFC), Henry Govier (Meshaw YFC), Ellen Abel (Tavistock YFC), Tim Laarveld (Winkleigh YFC), Ellis Sage (Sid & Otter YFC), Lauren Rich (Dartmouth YFC), Jack Broom (Honiton YFC), Keziah Hoskin (Meshaw YFC) with leaders: Laura Stanbury (Withleigh YFC) and Tom Rycroft (Chittlehampton YFC). The seniors who were successful at gaining a place on the 2017 scholarship and travelling to Slovenia include James Westcott (Culm Valley YFC), Louise Kittow (Withleigh YFC), Laura Grist (Cheriton & Tedburn YFC), John Malseed (Chagford YFC), Ben Warren (Chittlehampton YFC), Olivia Haddy (Kingsbridge YFC), Ryan Colwill (Woolsery YFC), Richard Rossiter (Kingsbridge YFC), Ryan Dobson (Yarcombe YFC), Adam Howe (Culm Valley YFC) and Charles Mill (Bradworthy YFC). Members travelling alongside them have won their place through Senior Member of the Year, John Spear Memorial Award and George Hingston Award, they include Alice Giles (Bow YFC), Michelle Batting (Culm Valley YFC), Jack Frankum (Cheriton & Tedburn YFC) and Clifton Ford (Chulmleigh YFC). Three members from Devon were awarded places on the National Federation Scholarships after tough competition from across England, with Skype interviews taking place in December. Congratulations to Daniel Grist (Cheriton & Tedburn YFC) who will be travelling on the RYE European Rally to Latvia, Kate Palmer (Totnes YFC) who gained a space on Africa’s Gift and Holly Gilbert (Cheriton & Tedburn YFC) who will be off to Argentina. The Devon YFC Federation are also offering a lucky member the opportunity to travel on the International Farming Youth Exchange trip to the US in 2017, with interviews taking place in January. For more information about the Devon Young Farmers Federation, visit www.devonyfc.co.uk. For a long time, the issues facing rural young people have remained difficult and unattended to. Research tells us that this is now the worst it has been. Young people are drifting away from Exmoor, not always because they want to see the world. Housing is unaffordable. The ‘affordable’ ones are largely unsuitable for agricultural and country work, even for young families in some cases, and rents are too high for local wages. Of the 5,000 houses on Exmoor, 1,000 are empty, others under occupied, yet rooms to rent are uncommon. Digital inclusion is emerging gradually, but until then delivery lorries get lost, online returns to Defra and HMRC are impossible in some areas, mobile phone communications for business and community life frequently drop out. Exmoor Young Voices are supporting the Park Authority in seeking full access for all, introducing innovative technical and planning solutions to overcome the blocks. Transport for young people trying to get to work, college, social life, and develop relationships, is extremely sparse. Where it exists the schedules are rarely suitable for working, social or sporting hours. West Somerset has the highest population of 60 to 74 year olds in the country. 60% of the population of Exmoor’s largest town are over 60. Schools are closing. Exmoor is the most isolated part of Britain with the poorest communications by road, rail, and digital options. This unbalances the Park’s economic stability. Looked at from young people’s perspective there is “No future for us here until we are wealthy or retired”. In a fresh approach to tackling these continuing problems, an imaginative group of young people have formed Exmoor Young Voices, Chaired by young agricultural builder William Lock. Supported by Exmoor National Park Chief Nigel Stone, Chair Andrea Davis, and Consultative Forum Lead Steven Pugsley, they conducted research among young people from Lynton to Watchet, Porlock to Dulverton, Brompton Regis through Hawkridge to Bratton Fleming. With ages ranging from 15 to 30 they have been able to use local knowledge and experience to identify the negative issues and offer positive solutions. More than 40 Young Voices have been talking, lobbying and listening to other young people, identifying their priorities for housing, renting, digital inclusion, transport, training and entrepreneurial initiatives. Their report can be found by searching online for ‘Exmoor National Park Young Voices’. Facebook is ‘Exmoor Young Voices’ and Twitter @ExmYoungVoices. They meet, hosted by Eric Norman at the Rest and Be Thankful, Wheddon Cross, to develop plans to help young people stay living and working in this National Park. Exmoor is the first National Park to adopt and listen to its own consultative group of young people. Some of the other 13 Parks are considering following suit. Tommy Lock, who works in land and property restoration, and Samantha Harris, an award-winning horse and Exmoor pony breeder, both young Exmoor entrepreneurs living and working in isolated villages, got the work started with Les and Marion Silverlock, a couple of retired villagers. Ben Cowling and Mike Julian, young agriculturalists, with Will Lock, have taken the work further, delivering seminars to the Houses of Commons and Lords for Hastoe Housing, educating decision makers about the problems in rural areas, and offering solutions. They have joined the Exmoor Consultative Forum and the Rural Housing Network to persuade Parishes and local housing interests to take action to halt the drift. Young Voices are challenging councils, charities, housing associations, and public services to listen to them, and pay special attention to maintaining a balanced population before it is too late. Creating change is slow. The shelf life of the Young Voices members is limited. They work long hours, travel regular long journeys on tight roads, continue their education and training, and manage the usual range of family changes. They meet to champion Exmoor’s future before it becomes a retirement home and theme park without petrol stations, schools, and working farms. Finding the time and travel expenses even to do this is difficult. They have a small fund and are seeking more. They would like to pay young entrepreneurs to develop and coordinate the Network, keep the advice and campaigning strong, and ensure the small voice of rural young people is heard in high places.